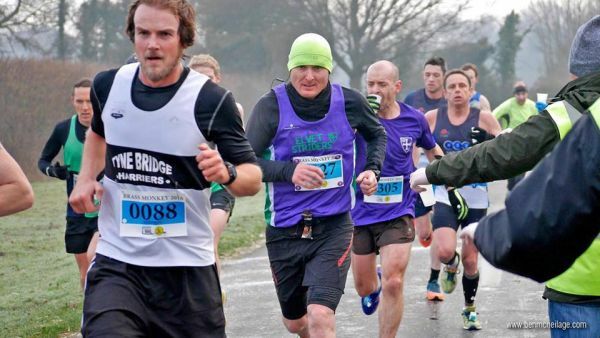 Although some may not see the appeal of a wintry run along main and minor roads which are not closed, I relish the prospect of this, the oldest 10-mile road race in Britain. Slick organisation, a net downhill course (albeit with a few negative decline challenges! ), friendly atmosphere and the lure of a carvery afterwards – what’s not to like? 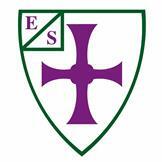 As B2C is a firm favourite on the club GP calendar, this also ensures a good purple contingent. Last year I had a good run, which left a time of 1:20:33 to beat. My plan this time was to nudge just under 5 min/km pace, which would break 80 minutes. Above all, I told myself to avoid the error of my ways last year – setting off like a scalded cat, which caught up with me later in the race. There had been some planning ahead of this day in the spectator department too – my Son Patrick was really looking forward to spending the day with Lewis, and watching the racing. The Strider bus weaved along the countryside to reach Brampton and upon arrival at the William Howard School, there were earnest discussions about the prevailing conditions, and whether long or short sleeves were the order of the day. I settled for my club vest but with the comfort of my gloves, beanie and as I’d had a niggle in my left calf, my fetching compression socks. After the team photo, we moved towards the start on Longtown Road. 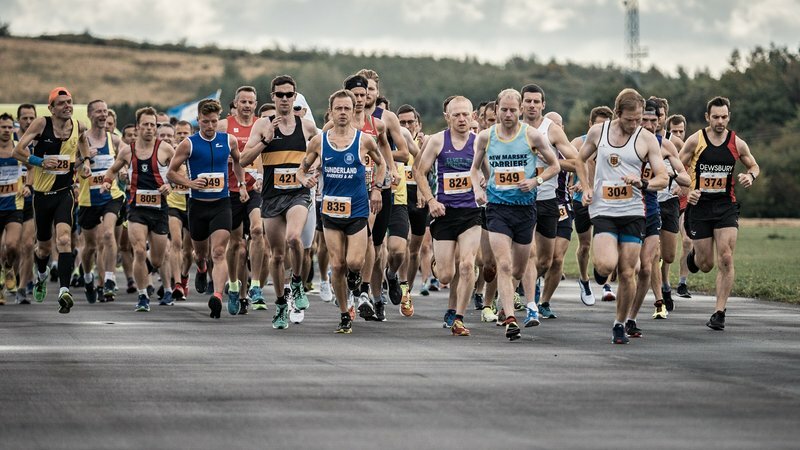 Having been before, I knew to expect a ‘surprise start’ – the road closed at the last minute, and a starting pistol fired rapidly to despatch some 500 runners on their way. The first stretch downhill with a sharp right turn to join the Carlisle road has a habit of encouraging a bit of an overly keen pace. 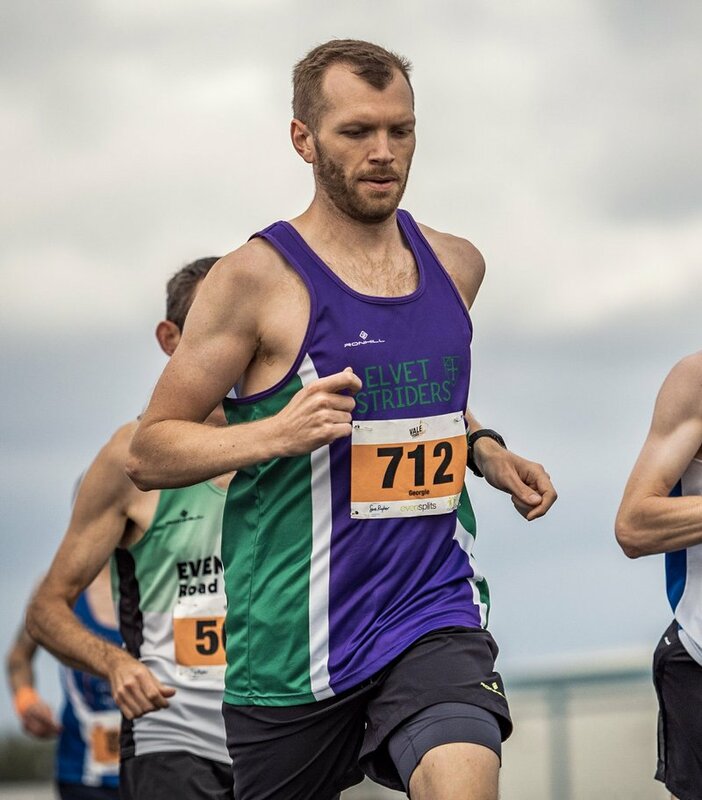 This year was no different, and as I ran along for the first 4 km or so at ~4:30 min/km with Graeme Walton, we remarked on how we had diverted a little from the plan. I knew the climb up to the Newby back road would settle me down, and it did. As I ran along these minor roads, thanking the volunteers on my way, I reflected on the remarkably dry conditions compared to the wading experience of the 2015 race. Natalie was in front of me and provided me with a purple vest to keep within my sights – try as I might, however, I could not catch her. Through Low Crosby, we re-joined the A689 towards Carlisle. 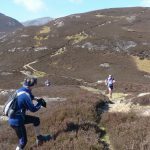 I knew there were a couple of undulations to come, and I told myself to keep calm – last year I’d developed a horrendous stitch in the last 2 miles which had been hard to recover from. I could see the houses on the outskirts of the City, and pressed on. To my left and ahead, I started to see the River Eden, and finally the Eden Bridge. I passed Andy and Mike who spurred me on, just before the final descent to the Bridge. On the Bridge, I was determined not to let the chap in front beat me, and to my left, I saw a welcome sight of two bobble hats – Patrick, and Lewis. As I got closer I realised this was a Strider funnel, and I gave it everything I had left to get ahead of the white shirt in front. I rounded into the finish funnel and smiled from ear to ear – job done! 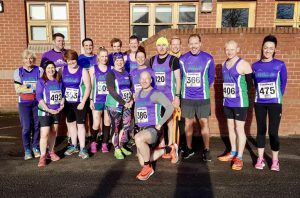 A hugely enjoyable race, with a PB of 1:15:37 and well done to all Striders who ran! 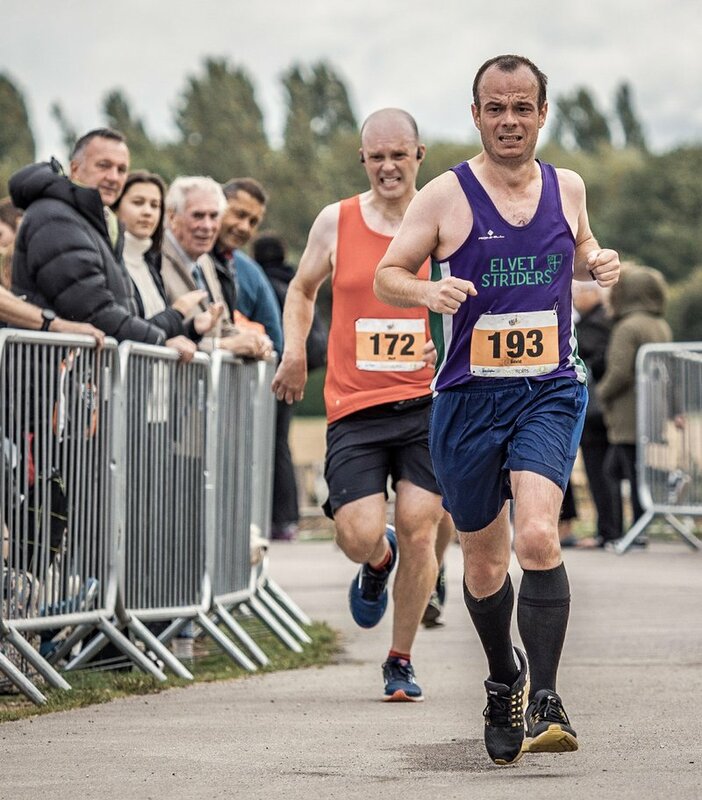 No medals for this race – I think I got a pair of socks in 2015, a lovely coaster last year which is on my desk, and this year’s prize was a race mug. 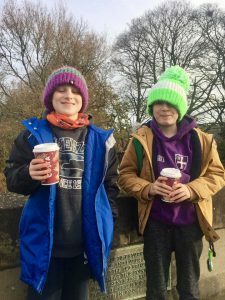 Thanks to the organisers who also let Patrick and Lewis have a mug each for their cheering efforts. 2nd time lucky? 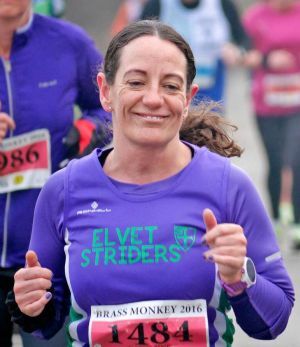 Last year, I settled for a rather splendid long sleeved top in lieu of my entry, and heard the tales of a splendid and scenic coastal run in the sun. This year, the race sold out in a matter of six hours but fortunately I secured an entry again, and had my sun tan lotion at the ready. Saturday evening saw me consider various weather forecasts, and contemplate my shoe and clothing choice. Having packed my hydration vest, at the eleventh hour, I abandoned it and decided for the minimalistic approach of club vest (fear not, I had shorts too) and trail shoes given the inclement weather anticipated. A Sunday morning reveille at 0600hrs (what else would any sane person do on their wedding anniversary?) saw me tiptoe around the house, and jog up to meet the Strider bus. 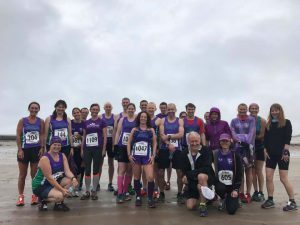 As I had stayed up quite late, reading old race reports of the Coastal Run and contemplating what lay ahead, I quite fancied a snooze on the bus but this notion rapidly faded, as the bus filled full of other chatty but half asleep Striders. We made good progress, and parked up in Beadnell, donning waterproofs to saunter down the road to the Boat House for registration. I always find it a challenge with my OCD to attach a bib number perfectly straight – to do this in the rain, with a fresh breeze on the upturned hull of a small boat compounded the challenge. Event clips and bib attached, I processed along the beach toward the start area at Beadnell Bay. There were portaloos portable toilets aplenty, and a fairly short queue leaving time to join fellow Striders to shelter and stay warm(ish), stowing bags on the baggage bus at the last moment, for the obligatory team photo on the beach. Lined up on the start, and raring to go, I listened intently to the official at the front – I relayed his information to other runners because I thought it was wise to heed the advice, which I summarised that runners should stay between the first set of marshalls to avoid perishing on the slippy rocks. Then we were off, across golden sands, the warmth of the sun on our backs, the breeze in our hair, amidst children building sandcastles, and enjoying ice-cream [error, that was a figment of my imagination]. Then we were off, across a sandy base of rivulets fed by the Long Nanny River, which set the scene of what would be a challenging race. I had struck out at a pace just sub 5 min/km, which softened as I met the first constriction point of soft sand and rocks up to High Newton by the Sea. 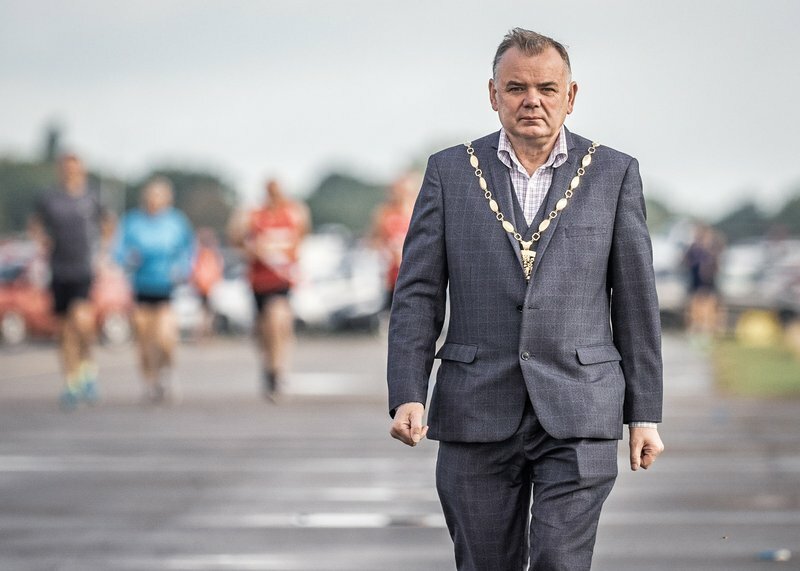 I was amazed at this point to see a runner relieve himself against the dunes in full view of other competitors – how could he have missed the vast provision of portaloos portable toilets, and council facilities adjacent to the start? Having climbed this initial hill, I enjoyed the short fast downhill section to Low Newton and the sands at Embleton Bay. We then negotiated the inland side of Dunstanburgh Castle, on mud, grass and rock paths, with a few slips and falls. I halted to check one poor soul who had taken an impressive tumble, landing hard but he was fine to continue. I passed a few runners, at this point lamenting their choice of road shoes, and wondered if Matt Archer had his racing flats on. Next up was Craster Village, at which point we were looking a little more bedraggled, our muddy battle paint splattered up our legs, and higher! Support was evident here, and water was provided. The encouraging sight and sound of Michael Mason galvanised my resolve as I climbed up past the harbour past The Heughs, where there was a cheeky kink taking us along the headland to Cullernose Point. Then a treat of a section of road past Howick, and on to Sugar Sands where the majority of runners took the bridge across Howick Burn but some hardier souls opted for the water crossing. A short but punishing climb ensued, up a rocky path, which I decided to run passing a couple who were walking, clearly conserving their energy to pass me on the flat on the top! Into Boulmer for the final water stop, which I needed, where supporters braved the conditions to cheer us on. Leaving Boulmer, just prior to dropping down to Foxton Beach, a cheery chap stood beside a sign which advised ‘about 2 miles to go’. He shouted encouragingly, that it we were nearly upon the beach and only 10 minutes to go. I looked at my watch briefly, trying to calculate what this meant but gave up as ‘nearly 2 miles’ was too imprecise a measure for me, a detailed metric man. This beach seemed never-ending, and I remember thinking about the meaning of this approximate 2-mile sign. I tried in places to pick up my pace, mainly because I thought if I did the race would be over quicker but there were slippy rocks, and dilapidated fences (really!) to cross. On one particular fence, my ability to hurdle non-existent, my right hamstring cramped as I ungraciously ‘hopped’ over it. I recovered to catch the magnificent sight of a blue inflatable finish arch. The arch got closer, and I tried to pick up pace, hastened by Jon Ayres who was doing a sterling job as a bare-chested Mr Motivator having already finished. Attempting to follow Jon’s advice of lengthening my stride, I managed to briefly return to that sub 5 min/km pace again, prior to what felt like sinking to my knees in the softer sand near the finishing arch. Through the finish, I immediately felt that sense of accomplishment which makes it all seem worthwhile; and a quick check of my watch confirmed a pleasing sub 2-hour time (subsequently 1:55:31 chip time). I grabbed some water, and headed over to provide some encouragement to my fellow Striders. Jon congratulated me, and I quipped that that last beach was like a club committee meeting in length! Then via the baggage bus, to the Strider bus, which now resembled something of an impromptu changing room. I was grateful at this point for Lesley’s advice to take a change of footwear, and in equal measure for her encouragement to attend this race. Prize giving was in the nearby Alnmouth Links Golf Club, which provided an opportunity to dry out, and celebrate the team achievement. It was great to see Stephen Jackson pick up a prize for 5th place, a valiant effort indeed after his Durham City Run win of only a few night’s previous, and to see other age category winners; Tamsin Imber for 1st FVET40, Christine Farnsworth for 2nd FVET65 and Margaret Thompson for 3rd FVET65. The organisation of this race by Alnwick Harriers is first rate. Marshals and locals alike are friendly, and supportive. 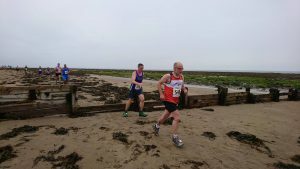 The coastline and scenic aspect is fantastic, and where else can you run ~14 miles through an Area of Outstanding Natural Beauty on a mixture of sand, road and trail? 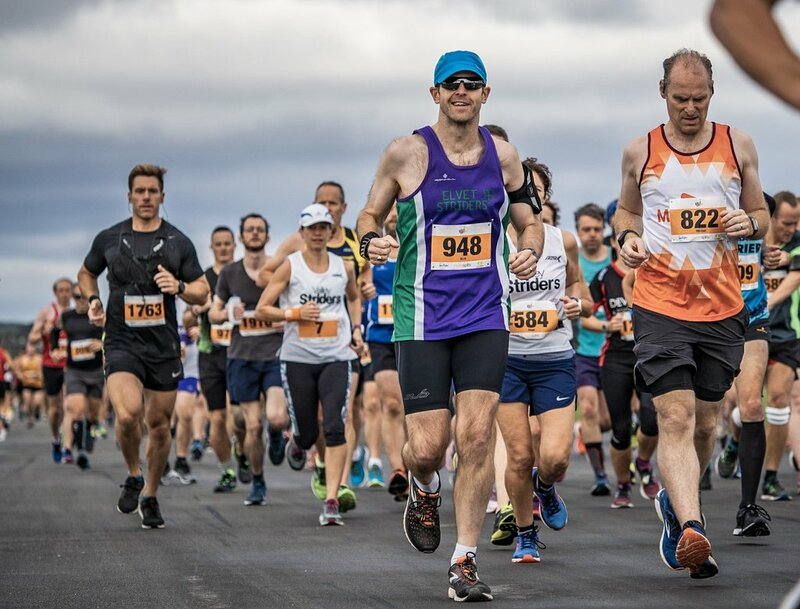 In summary, I’d encourage anyone to have a go at this race – I’d certainly like to do it again, but hopefully next time on a drier, more summery day! 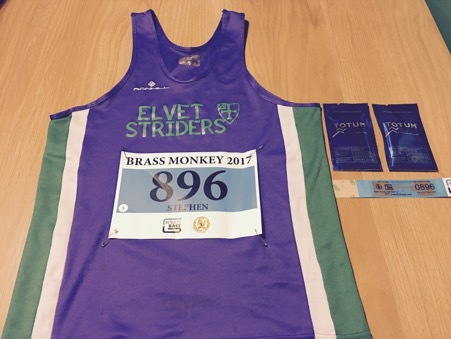 A cold, but not freezing, morning in York for the 35th Brass Monkey half marathon. The weather, as it turned out, was pretty kind to the 1500 or so runners. The drizzle had disappeared by the time the race started at 10:00 and the wind was barely noticeable. If you enjoy road running there is no denying it’s a cracking race. 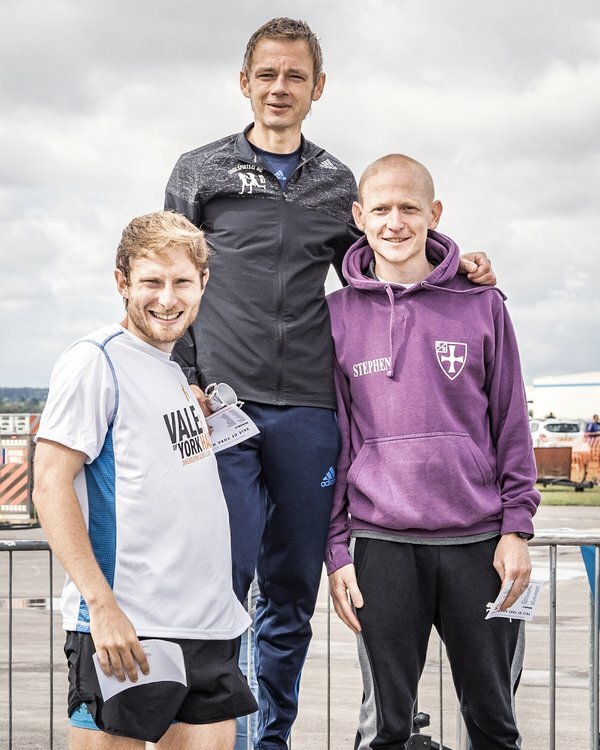 York racecourse provides the organisers with a great base for runners and spectators alike, the course is as described; ‘fast and flat’ and the marshals and officials do a great job making everyone feel looked after. 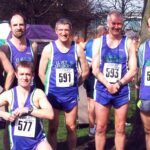 I have a theory that the January date is particularly appealing for club runners looking for a ‘post-Christmas’ target – a reason to pull on the high-vis kit through December. Whatever the reason, this is a popular race with a capital P and apparently sold out in 38 minutes. Unlike last year, this time I had a plan. Go out at 75 minute pace and (3:33/km) and try to pick it up towards the end. As it worked out I had some company for a big chunk of the race as a group of 5-6 runners from various clubs around the North East, including captain Gareth Pritchard, worked together in a little pack – each taking a turn to lead the group. 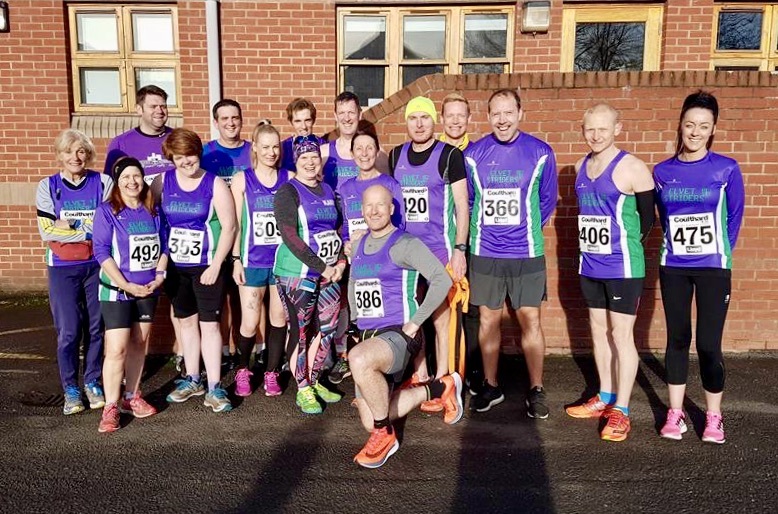 This worked really well up to 9/10 miles when I decided to make a bit of a move – followed only by one runner from Roundhay Runners in Leeds. It emerged that we had a similar goal in mind and again, the ‘strength in numbers’ approach helped build the momentum towards the end of the race, which was now in sight (metaphorically speaking). 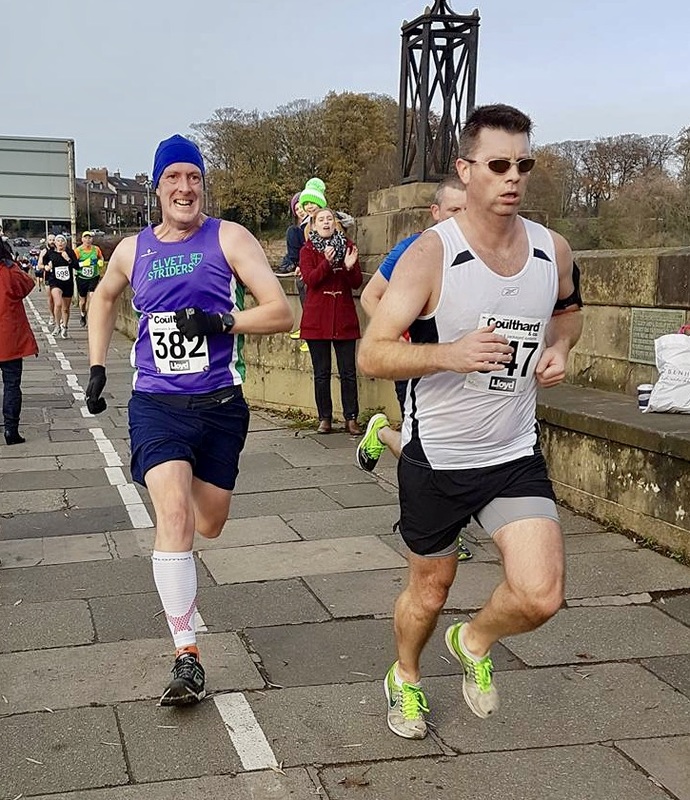 As we hit the railway bridge with a couple of miles to go I had a little bit left in the legs, and pushed on again with my pace now nearer to 10k effort (3:22/km) – time for my end of race mantra ‘now or never’. So, a second over 1:14 according to my watch, a second under according to my chip; I always did like chips. 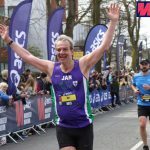 A new half marathon PB of 01:13.59 and a post-race analysis of ‘job done’. 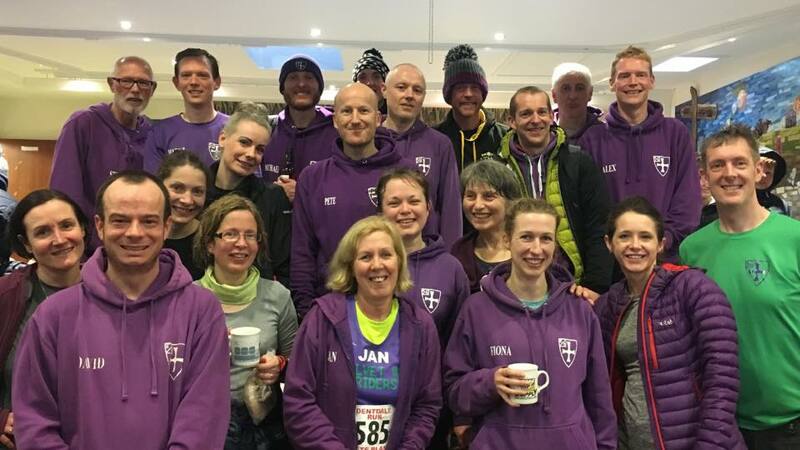 A very popular race with fellow Elvet Striders in abundance with lots of smiles and encouragement pre and post-race. I really hope this can be the first entry on the running calendar for 2018, it is most certainly one of my favourites. Having found myself up at some ridiculous time earlier in the year to secure the entry I was once more rudely awakened from my sleep very early on Sunday morning because of the Brass Monkey! I had high hopes for a PB with all the talk of a fast and flat course but was also nervous my PB at Keilder had been a fluke and that the ice may scupper any plans we had for a fast race. It was great to catch up with some of the strider posse before we all went outside and lined up for the race. After a few announcements we were off, it was absolutely freezing, but bright and clear and there was a great buzz from the crowd – runners and spectators. Along the way the support from the marshalls & spectators was great and I thought the surrounding areas were very pretty, despite it being a road race. 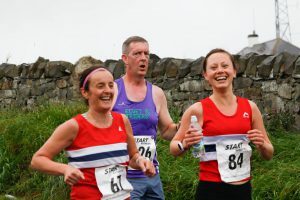 I spoke to a couple of Striders on route, Robin Linton and Jayne Freeman which was a welcome distraction for me but all in all just tried to focus on sticking to pace and not spilling icey cold water on myself at the water stations! I had a bit of a panic when my garmin dropped out and said I was doing 11 min miles all of a sudden as we went through a wooded part but some lovely regular Brass Monkey runners said “that always happens here love” phew!!!! 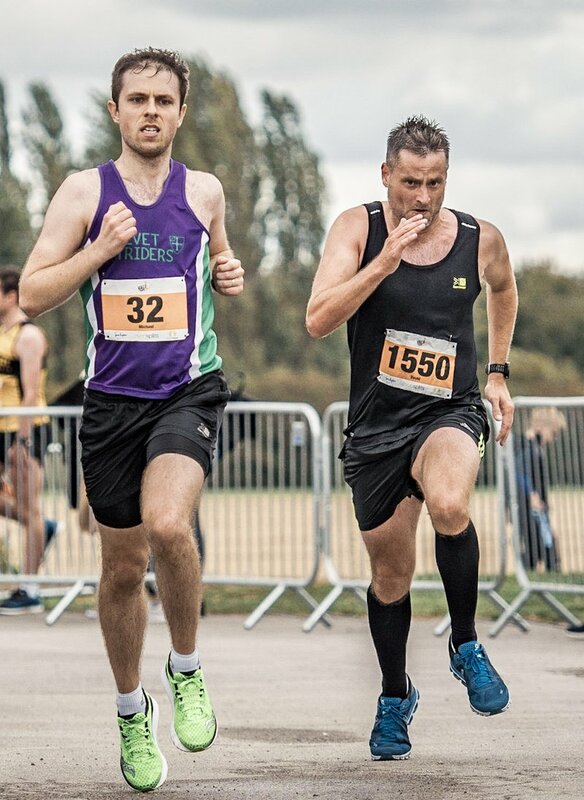 Apart from that minor shock I was loving the race, I was ahead of pace and feeling strong, I was starting to believe I had sub 2.05 in me & pushed on. I struggled a little from mile 11 so the frozen jelly babies were very gratefully received around Mile 12. 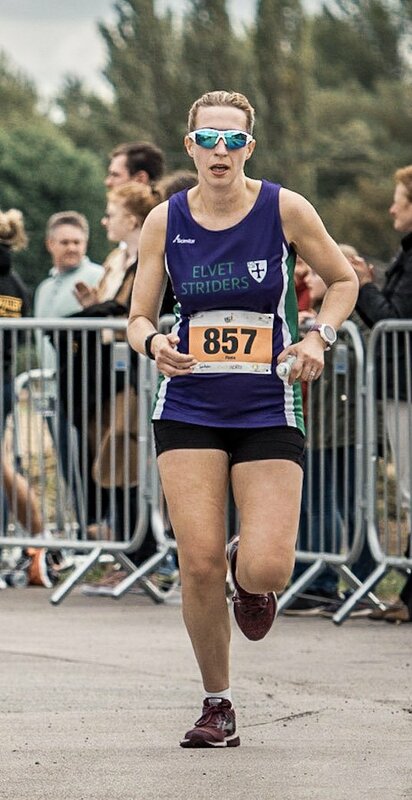 Pacing still on track and lifted with the sugar hit and shout outs from the crowd I pressed on, trying to work out the pacing maths in my head distracted me from the pain of the last mile and a bit which seemed to go on forever! 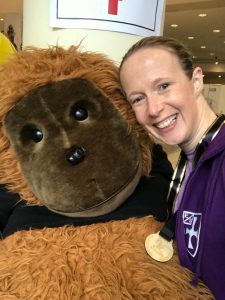 I could finally see the finish line and I knew I was ahead of the sub 2.05 target – I was so elated but just kept telling myself not to fall over! I crossed the line at 2.03.13 (official chip time). I actually squealed as I read the text much to the shock of those around me at the time who thought something bad had happened! I was absolutely delighted to hear that Gareth and James had also PBd along with many of the other purple posse! 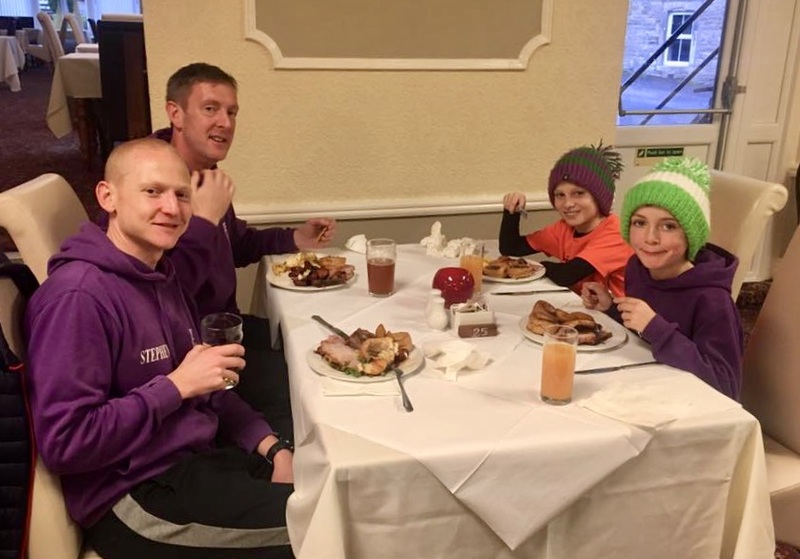 We celebrated Kerry coming in ahead of her planned time and then went on the hunt for much needed refreshments hearing the achievements of many of the club as we passed them enroute including Penny, Matthew, Michael and Kelly who all reported excellent PB times. I have officially classified this as my new favourite race (didn’t have an old favourite race to be fair!!) I loved the whole day (not just cos I PBd) and will definitely be setting my alarm for next years entry!